Could you Prove your Product is Secure? Firmware Update is a free, monthly-ish newsletter by embedded systems expert Michael Barr. Firmware Update is a trademark and this issue is Copyright ©2019. You may forward whole issues to colleagues that design embedded systems. No other uses are permitted. Earlier this month, telecom equipment powerhouse Huawei debuted a "Cyber Security Transparency Center" in the capital city of the European Union. If you've been following the headlines, you will recall that the Shenzhen-based company has been under pressure from the U.S. government, which alleges it is an agent of spying on behalf of China and will no longer purchase its products. Furthermore, the company's CFO has been arrested in Canada on charges of violating economic sanctions against Iran, North Korea, and Syria. So what does Huawei hope to prove by way of this new "transparency"? For one thing, that allegations of secret “back doors” for espionage in its network equipment are speculative and do not comport with reality. The company announced that at the new center in Brussels, its customers and their independent security experts will be permitted to review Huawei’s source code. But what does this actually mean? Is all of the source code present? How will researchers be able to validate that it's all there and the right code? And, at least as importantly, is the hardware--including custom CPUs--on which all that software runs free from backdoors? Are those designs there too? First published ten years ago, the rules in my book Embedded C Coding Standard are followed by embedded software developers who want to reduce time spent during the debugging stage of their projects as well as improve the maintainability and portability of their source code. 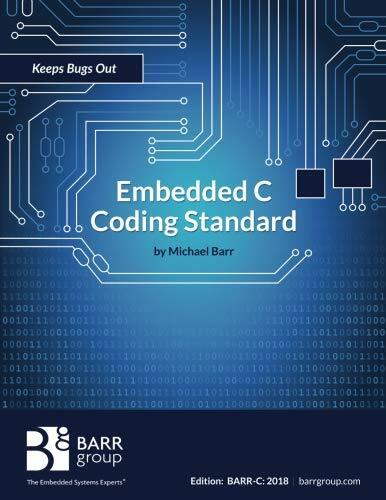 In this updated "BARR-C:2018" edition, we've eliminated our few prior conflicts with the MISRA-C subset of C for use in safety-critical systems--so that these popular bug-killing standards can be used in combination. Followers of earlier versions of BARR-C will find that little has changed about the rules themselves. However, many rule clarifications were added along with new code examples. Consult the full training calendar for prices and other details. Alternatively, consider bringing an instructor to your office for an on-site training for your whole team. Teams of five or more usually find this is more cost effective than attending public courses.